Comes with Detailed Information Card. Dipped and Heavily Electroplated in Silver. Size: Each Crystal Point is Naturally Unique and will vary in Size from 1 1/2 to 2 inches. Crystal Point made from Rock Quartz and Holds Tumbled Rose Quartz Crystal. Handcrafted with Love and no two Amulets are ever alike. Only Genuine Gemstones are used and may or will have natural specks and inclusions making your Amulet Unique. 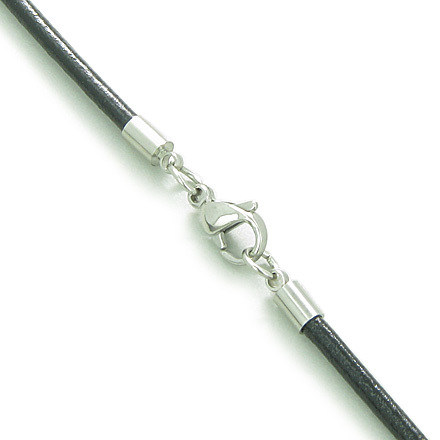 Comes with Very Popular High Quality 18" Black Leather Cord and Stainless Steel Buckle and makes this Amulet ready to wear. This is Astrological Taurus Amulet, as it comes in Two Individual Gemstones and each holds different and Unique Energies and Forces. Gain Self Protection, Good Luck and Magic powers with this attractive and one of the Kind piece of Jewelry. It is Dipped and Heavily Electroplated in Silver. Amulet is made with Love and Care and no two pieces are ever alike, making your Amulet as unique as it may get. 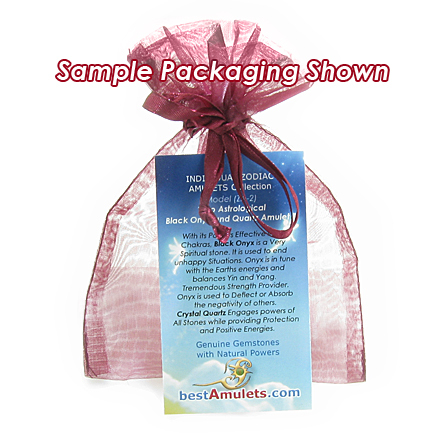 This Amulet is Made from Genuine and Natural Rose Quartz and Crystal Quartz Gemstones. Each is Handcrafted as Crystal Point wand with Tumbled Gemstone accent and makes this Amulet very Special and Attractive. Rose Quartz very Soothing and Happy stone. It raises one's self-esteem. Circulate energy throughout the heart Chakra, bringing inner nourishment and comfort. Also allow you to communicate internally with your spirit guides. 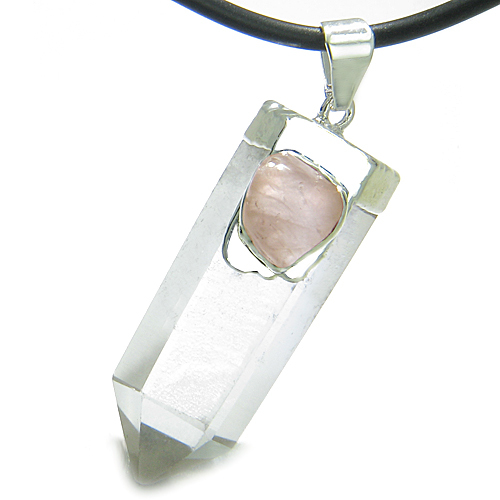 The high energy gives Rose Quartz the property of enhancing love in virtually any situation and lowers stress. Crystal Quartz Engages powers of All Stones while providing Protection and Positive Energies. Combination of these Gemstones creates Unique Energies and Powers for it's wearier and fills Life with harmony, balance and positive forces. You will absolutely Love your New Amulet and Enjoy it's Unique Outlook. This product was added to our catalog on Tuesday 08 May, 2012.